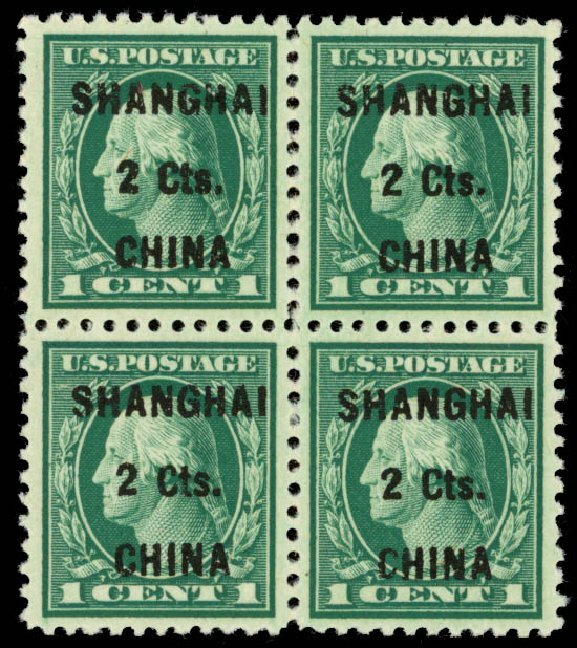 U.S.; Offices in China, 1922, 2¢ on 1¢ Green, Plate Block of 6, #K17, n.h., large top #10595, light gum wrinkles, Fine. 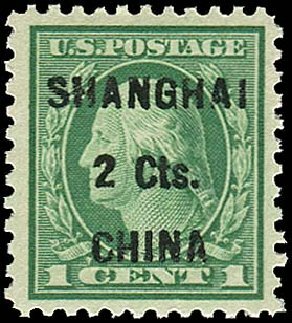 Scott $1,750. Estimate $300-400. 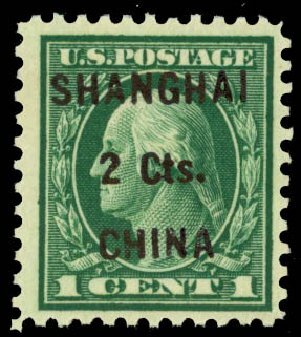 Offices in China, 1922, 2¢ on 1¢ green (Scott K17), o.g., never hinged, beautiful example featuring extra large margins and captivating fresh color, an immaculate stamp, Very Fine to Extremely Fine, with 2012 P.S.A.G. certificate. Scott $250. Estimate $250 – 350. 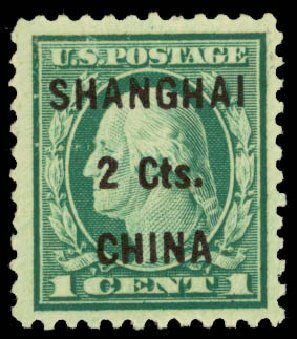 Offices in China, 1922, 2¢ on 1¢ green (Scott K17), o.g., never hinged, sensational deep rich color, an incredibly fresh example with oversized margins, Very Fine, with 2012 P.S.A.G. certificate. Scott $250. Estimate $200 – 300. 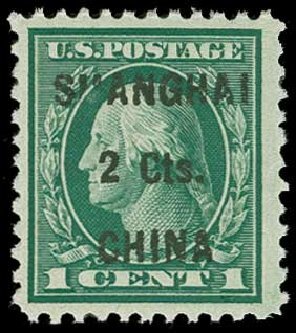 Offices in China, 1922, 2¢ on 1¢ green (Scott K17), o.g., never hinged, handsome example featuring gorgeous color and impression, in pristine condition, Fine to Very Fine. Scott $250. Estimate price $150 – 200. 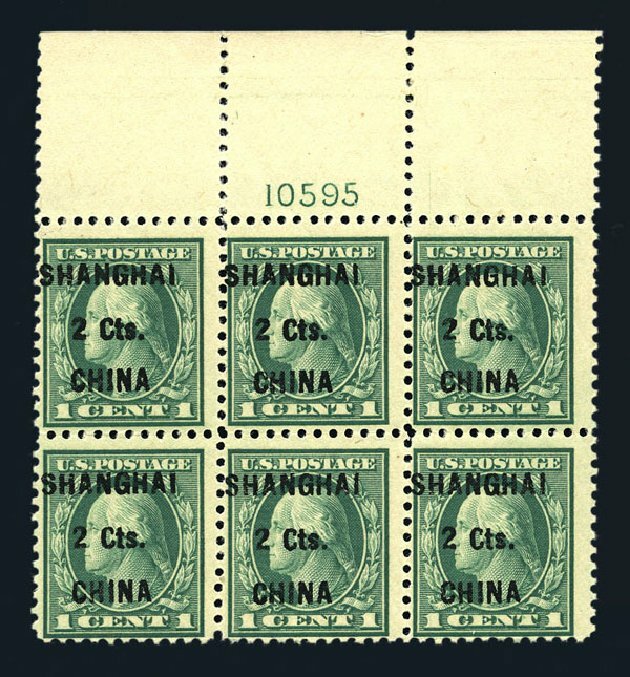 Offices in China, 1922, 2¢ on 1¢ green. 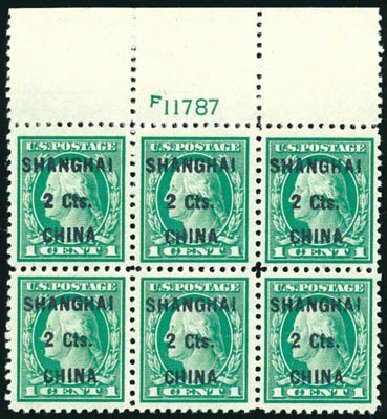 Top margin plate block of 6 with plate number F11787, disturbed o.g., bright fresh color, well centered, Very Fine to Extremely Fine, scarce in this choice condition. Scott No. K17; $850. 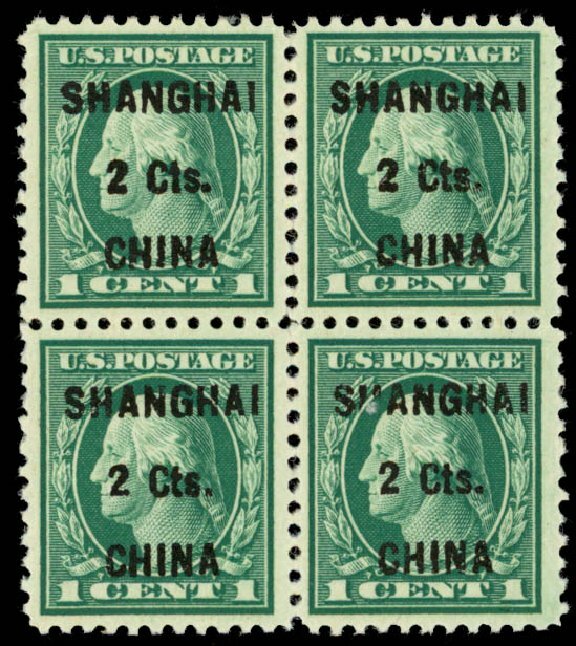 Offices in China, 1922, 2¢ on 1¢ green. 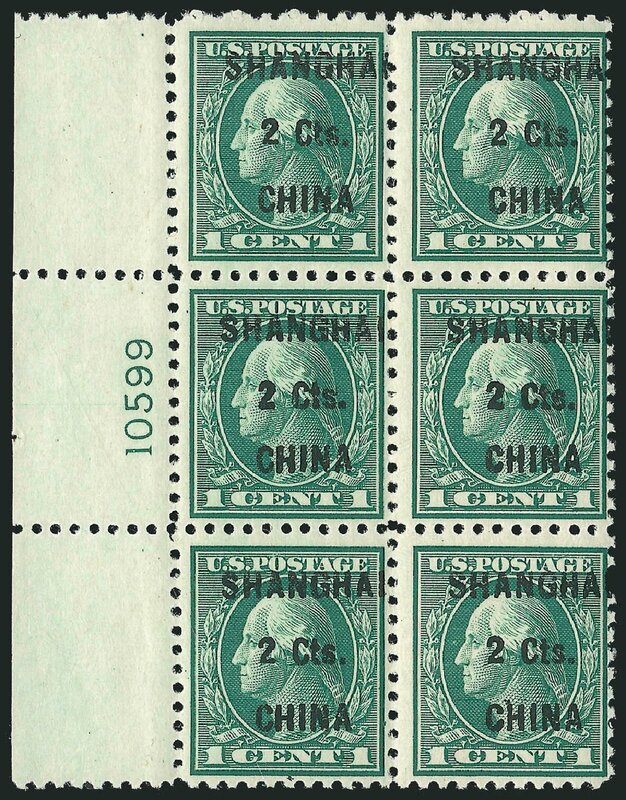 Left margin plate block of 6 with plate number 10592, o.g., never hinged, light natural gum bend affecting top left stamp, deep fresh color; plate single with usual staple holes, Fine. Scott No. K17; $1,750. 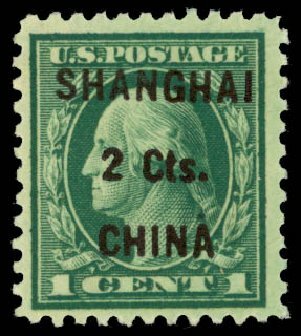 United States – Offices in China 1922 2c on 1c green, block of 15, also a pair and a block of four, two stamps h.r., others never hinged, usual dried gum (from glassine interleaving), off-centered to top, v.g. 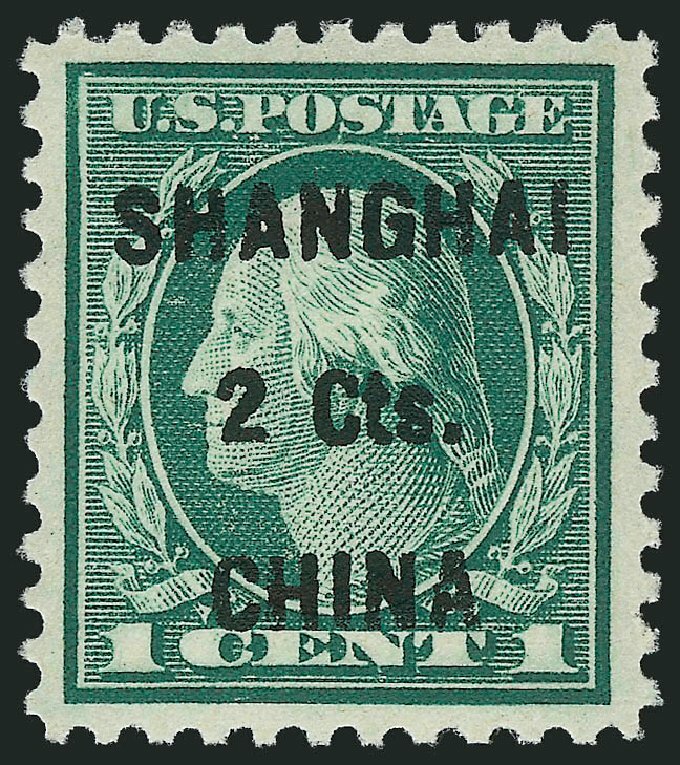 USA (Scott K17) 1922 OFFICES IN CHINA ‘2 Cts.’ ON 1¢ GREEN Fresh, MINT never hinged, extremely fine. 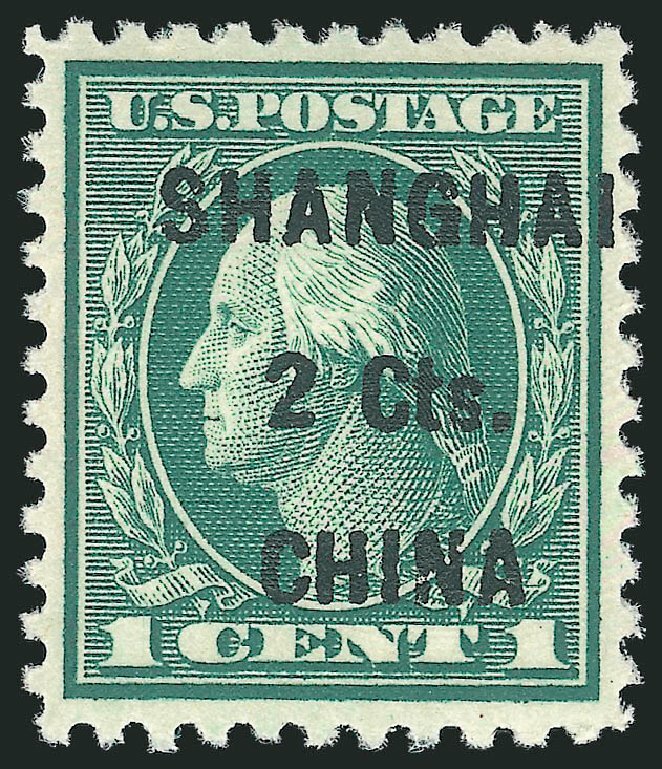 (Copy of 2014 PSE Cert #01286478 for pair) Cat value $250. 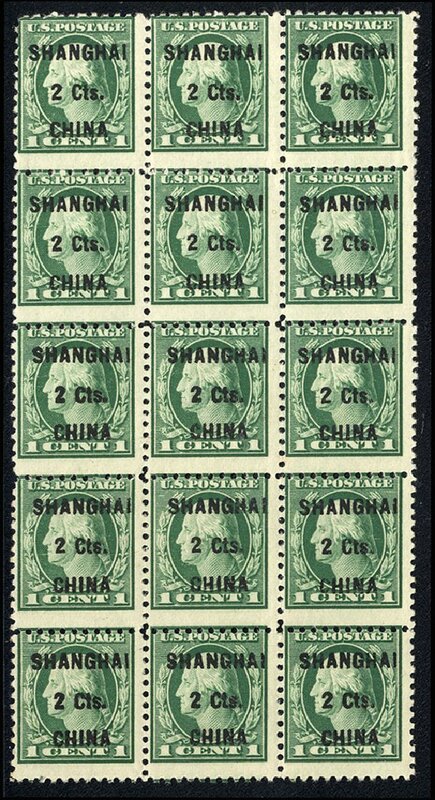 Offices in China, 1922, 2¢ on 1¢ green (Scott K17), block of 4, o.g., never hinged, this multiple is what only can be described as the finest known mint block, beautifully centered particularly the right two stamps which are perfect GEMS, with brilliant color and razor sharp impression; how this multiple has remained intact over the years is hard to imagine, as collector demand for top quality singles has forced the breaking up of these precious multiples; with current PSE pricing valuing top quality singles for $1,550 in the grade of XF-Sup-95, and $3,250 in the grade of Sup-98 we may be seeing the last of this remarkable block; a fabulous showpiece certainly deserving placement in the finest collection, Extremely Fine to Superb, 2014 P.S.E. certificate. Scott $1,000 for singles. Estimate value $3,000 – 4,000. 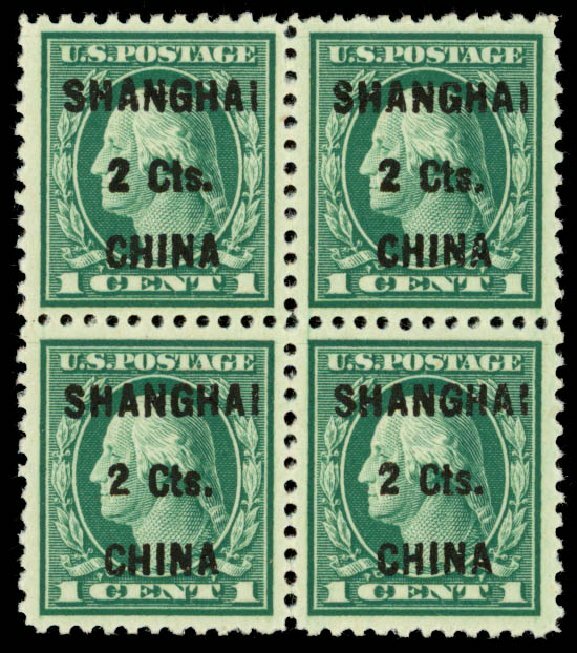 Offices in China, 1922, 2¢ on 1¢ green (Scott K17), block of 4, o.g., never hinged, absolutely gorgeous top quality multiple, beautifully centered with an incredible depth of color; rarely does this stamp come so well centered and a true condition rarity when found in this marvelous state of preservation, Extremely Fine, 2014 P.S.E. certificate. Scott $1,000 for singles. Estimate price $1,500 – 2,000. 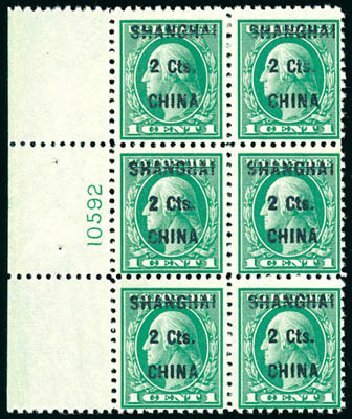 Offices in China, 1922, 2¢ on 1¢ green (Scott K17), block of 4, o.g., never hinged (natural gum crease in only the bottom left stamp), fresh and appealing well centered block with vivid fresh color, in P.O. fresh condition, Very Fine, 2014 P.S.E. certificate. Scott $1,000 for singles. Estimate $750 – 1,000.